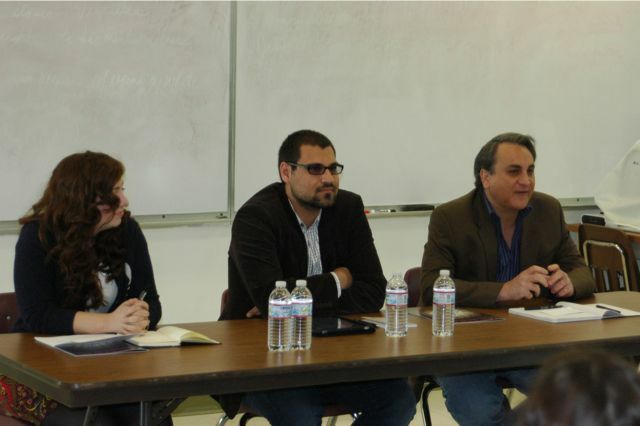 On Sunday, May 23, I had the privilege of speaking about journalism and Armenian media at a panel discussion hosted at the AGBU Manoogian-Demirjian school in Canoga Park. The panel also included longtime journalist and Horizon TV anchor Paul Chaderjian and freelance writer and ianyanmag.com editor Liana Aghajanian. Organized by English Department Chair, Paul Martin, the conference focused on topics such as new media, the transformation of journalism and the advent of social media. The three of us shared our experiences in the industry with students, faculty and parents and spoke about the various opportunities that exist today because of the dramatic transformation and democratization of media. Much to my enjoyment, the audience had many questions for us and everyone was eager to explore the topic in detail. The panel moderator, a bright up-and-coming writer, named Vatche Yousefian, did a great job bridging the topics and guiding the discussion. Paul Martin covered the entire panel in great detail here on his blog, The Teacher’s View. Prior to today’s conference, my students gathered together to draft topics and questions for the panelists. They boiled down their inquiries to several key areas: One, the students wanted to know the journalists’ opinions about devices such as iPads, Kindles, Nooks, and other electronic reading gadgets, and how they might benefit the writing and journalism industries. Since several students have blogs and also read them, they were looking for tips and techniques for creating content and reaching a wider audience. Third, the concept of citizen journalism was a prominent interest, since so many news organizations now have links for submitting stories from the average person-on-the-street. Finally, the subject of newspapers and magazines, particularly what form these traditional publications might take in the future, concerned many students, as they are interested in majoring in journalism or working in media in the future. A few day’s before the panel, I forwarded to Paul Martin an article Paul Chaderjian and I co-authored exploring the prospects of a new Armenian revival in the age of digital media and hyper-connectivity. The article, titled, A 21st Century Zartonk: An iRevival in the Modern Age of iFedayees, was given to the students to read ahead of the discussion and, I believe, served as a solid bridge connecting the greater media world to their personal Armenian world.